I just didn't get it. A 10 inch fragile screen that does everything a budget laptop can do, for twice the cost. On top of all that, it lacked a keyboard, so it would be useless for word documents and taking notes. As someone who often finds themselves in a classroom, I did not find that at all attractive. Flash forward two years, and my perspective has completely reversed. This is mainly due to two reasons: the influence of smartphones in my life and the more diverse range of tablets on the market. Back in 2010, I still owned a dumb phone. Therefore, I had no idea just how great things like "apps" were before I finally got an Android phone in early 2011. As you might have guessed, this had a strong influence in me disregarding the vanilla iPad in 2010, as I had no previous experience with smartphones and therefore could not appreciate what it meant to transport that "Iphone experience" onto a larger device that contained much better hardware. However, even with a smartphone (of the Android variety), I remained unconvinced that a tablet was necessary in my life. I told myself that my smartphone could do everything a tablet could do, and brushed off new iterations of the iPad, as well as its competitors. The first time I truly considered buying a tablet was when Amazon released the Kindle Fire. I really liked the idea of having an e-reader, and I didn't want to buy one of those entry level e-ink devices because I knew I would rather have something with more bells and whistles. Now, I was finally starting to see the point of this tablet craze. A smartphone on steroids, able to be utilized as an e-reader/entertainment device to a much greater degree due to the size and quality of their screens. For me, the reading aspect was key. My smartphone has a 3.5 inch screen, and for reading, that just doesn't cut it. A tablet presented me with the opportunity to essentially carry around a newspaper or book in my pocket, and unlike with my phone, I wouldn't have to squint to see the text. I ended up passing on the Kindle Fire mostly because it was Amazon's first foray into the hardware side of things, and though their attempt was admirable, I knew there would be a better version coming out soon. Luckily, I was right. And no, it's not the Kindle Fire 2. 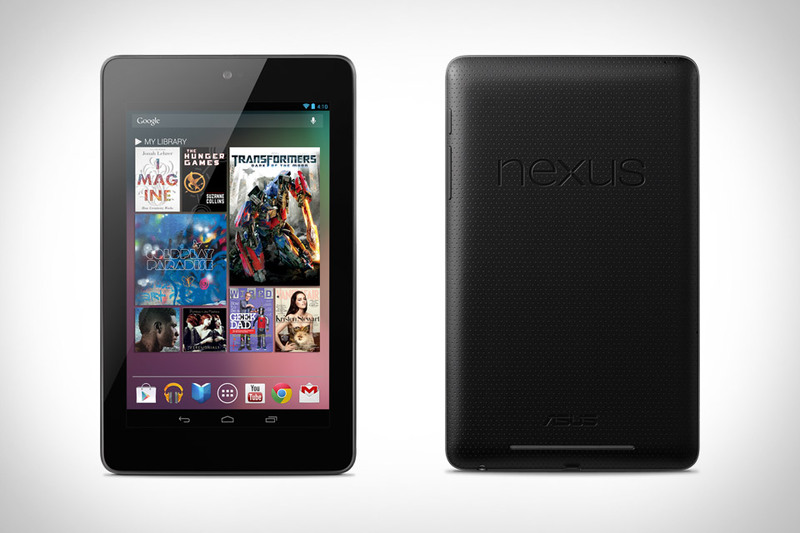 It's the Google Nexus 7. Google (partnered with Asus) managed to create a tablet that improved upon the standards set by the Kindle Fire in every way, creating a 7" device that is portable, affordable, and packs an enormous amount of processing power. For these reasons, I bought one a few weeks after they made their debut in July. You may ask why I didn't go for the iPad. Well, the answer is simple. One, it was way too expensive. The N7 (as it has been nicknamed) is only $250 for the 16gb version, a price that was much easier to swallow than what Apple was asking for with even their cheapest iPad iteration. Secondly, I really prefer 7" tablets like the N7 over 10" ones like the iPad. To me they offer the perfect mix of portability and usability. Seriously, I can hold the N7 in my hand almost as comfortably as my smartphone, and the screen quality and legibility is nearly equal to the retina display on Apple's newest iPad. That to me is a huge plus when you are buying something mainly for its ability to be a portable super smartphone/ PC. In closing, there's just something about the tablet interface that makes it incredibly easy to get lost in a wealth of interesting articles, songs, movies, and books for hours on end (in my case, it probably has something to do with the N7's Android 4.1 operating system...). The apps you love on your smartphone are ten times better on a tablet, and after using things like Pulse, Currents, and Pocket on something like the N7, I'm sure you'll agree. Indeed, I'd be surprised if you could stomach using any app that requires heavy reading on a smartphone after experiencing what a tablet has to offer. With the Google Nexus 7 and the Apple iPad, consumers now have access to two great tablets that are sure to serve you well. As you may have guessed, I'd suggest the former only because I love the smaller size and the fact that it's Google's flagship device; the latter of which means that it will get priority in terms of receiving new OS updates and having apps optimized for it. Really though, you can't go wrong, and in the end your choice will probably come down to whether or not you own more Apple or Google (Android) devices. It was difficult for me to disassociate tablets from the stigma that they were merely underpowered laptops without a keyboard, but I'm glad I did, as they truly are amazing devices. My journey in coming to the same realization and conclusion on the concept of tablet use resembles that of your article. Truly amazing devices. I'm a student myself and researching is the norm every other day. I currently own a 4.5" HD screen on my smartphone and as spacious as the screen can be, reading articles such as this one can be an eye sore. Screen size is key and 7" is definitely optimal for comfort ability and usage. Thanks for the great read and your story and opinion was the ultimate push in locking my decision in getting the N7. Ill be buying one in the near future. Great Post! Very helpful! Google Nexus 7, it is good, but I hope that Google can release 10.1 inch tablet pc ASAP. Looks like they heard your advice!